A Neolithic burial mound near Stonehenge could contain human remains more than 5,000 years old, experts say. The monument in a place known as Cat’s Brain in Pewsey Vale, halfway between Avebury and Stonehenge in Wiltshire, was identified in aerial photographs. Archaeologists and students from the University of Reading are due to excavate the site. It is the first time such an archaeological site in the county has been excavated for 50 years. The site is made up of two ditches and an apparent central building, which may have been covered by a mound, that has now been flattened due to centuries of ploughing. The site, in the middle of a farmer’s field, was assessed in a geophysical survey. It is believed it could contain human remains buried there in about 3,600 BC. Dr Jim Leary, director of the university’s archaeology field school, said: “Opportunities to fully investigate long barrows are virtually unknown in recent times and this represents a fantastic chance to carefully excavate one using the very latest techniques and technology. Dr Leary’s co-director, Amanda Clarke, said: “This incredible discovery of one of the UK’s first monuments offers a rare glimpse into this important period in history. 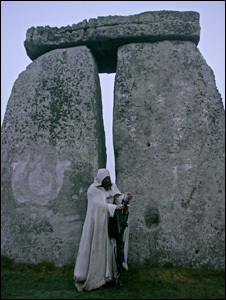 Follow us on Twitter and Facebook for daily Stonehenge News.